The Islands of Adventure is a theme park twinned with Universal Studios and is, in my opinion, the best of Orlando' s theme parks. The current main attraction is the Wizarding World of Harry Potter, a marvelously atmospheric recreation of Hogwarts, Harry' s school featured in J. K. Rowling' s novels, with its passageways, corridors and classrooms to wander through and explore. A short stroll along cobbled streets takes you to the shops of Hogsmeade, situated in snow covered ancient wooden styled buildings. The names will be familiar to Harry' s readers, Dervish and Banges supplying magical and wizarding supplies, Filchs Emporium of Confiscated Goods for clothing, toys and movie prop replicas, Honeydukes the sweet shop, Zonko' s with its' novelty items, jokes and toys and last but certainly not least, Ollivanders the wand shop where the wand chooses its' owner rather than vice versa. Early in December 2010, all the shops and rides were fairly quiet but Ollivanders still had a lengthy line standing patiently at the door waiting for a private consultation to acquire a wand. We purchased an official Gryffindor scarf for a friend and at thirty five dollars, it was a little expensive but at least felt like decent quality. There are plenty of souvenirs available. There are three rides in Harry' s World. The Dragon Challenge (which is the old dueling dragons under another name for those who have been before), involves two roller coasters racing against each other and, on occasion, towards each other at sixty miles an hour on two separate tracks, twisting, looping and almost colliding not once, but three times! This is my favourite ride and worth the effort to wait for the front row if you can spare the time. The Dragon Challenge is only dueling inverted roller coaster in the world. The two dragons each have their own name, Hungarian Horntail reaches speeds of 63 miles per hour and Chinese Fireball reaches speeds of 57 miles per hour. Riders must be over 54 inches in height. The Flight of the Hiffogriff is a family roller coaster taking passengers on a test flight over Hadrid' s Hut and the Forbidden Forest. It also gives riders a great aerial view overlooking Harry Potters Wizarding World. The Forbidden Journey is a very clever groundbreaking new ride that takes passengers on a memorable journey through many features of the Harry Potter films and books. ' Robocoaster' technology enables the carriages, held by a robotic arm, to tilt, turn, twist and drop. The Forbidden Journey is not a rollercoaster as such, rather a scenic ride utilising movement and screens. For anyone wanting to quench their thirst during their visit, one of the refreshments available is butterbeer, a J. K. Rowling invention which was quite sweet and very tasty. It is also rather frothy, leaving a cream covered moustache on your upper lip. Good fun for the kids. It comes regular or frozen and both are delicious! The only restaurant in Harry Potter' s World of Wizardry is the Three Broomsticks and as the series is based in the United Kingdom, it was no surprise that the menu consisted of fish and chips, shepherd' s pie, Cornish pasties along with favourites, Turkey legs, BBQ chicken and ribs. Soups and salads are also available, as is a Great Feast for orders for more than four persons. Drinks include butterbeer, frozen butterbeer, pumpkin juice and a Scottish ale called Hog' s Head Brew. There' s plenty of seating and also an outdoor patio area towards the rear. 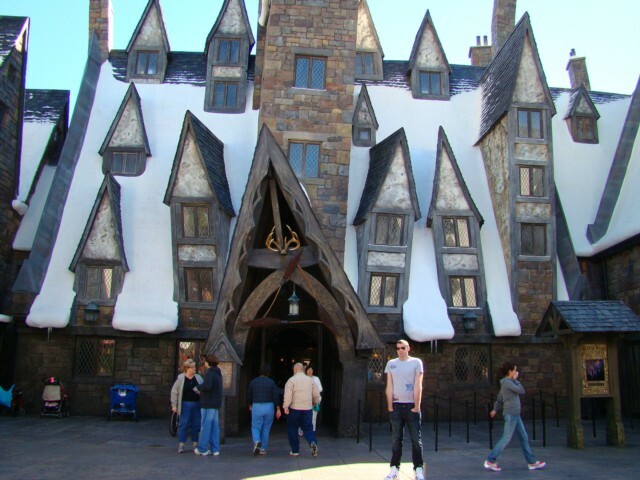 The Wizarding World of Harry Potter is actually quite small but makes good use of the space that was available to it. All in all, a very entertaining trip and combined with the rest of Islands of Adventure, makes for a great day out. Viewed 4206 times since 15 January 2011.